We took Quixote into our facility in August, 2013. At one time, he was advertised for $15,000 and jumped 3+ feet. His owners had purchased him from a trainer, but he was much too horse for them, and their daughter lost interest. The owners quickly became afraid of him, and left him in the stall for longer and longer periods, until he was quite dangerous to handle. He languished in a stall for several years. Eventually they could not longer afford him other their other horse, and we took them both. 1. An advanced rider. Quixote likes to intimidate his rider (something he learned from his previous owner). He does this by making a small jump into the air and then bucking. He doesn’t run away, he essentially just stands there and waits for the rider to jump off (we’re assuming that’s what his previous owner did). He does not do try to intimidate our trainer when she is riding him at a walk/trot, although he will sometimes try at the canter. Quixote’s owner will have to have a firm seat- a “hunt” seat will not work for him. A person who rides dressage will be able to get him to work well. 2. Daily work and/or turnout. He does SO much better when he is worked everyday- he is NOT a horse one can take out once a week. He needs to be ridden and/or longed everyday. He not only LIKES to work, he NEEDS to work. 3. Quixote will need a rider who can ride him safely, but we also think that it would be a good idea for the rider to have a trainer. 4. Quixote gets attached to other horses VERY quickly (within hours). He would NOT be a good backyard horse, or a horse who can form at attachment with another horse. He does very well when he has several horses around him, so he would need to be at a stable, and preferably in the middle, so he can have several horsie friends- that way when one or two are gone, he does not feel like he is alone. 5. Quixote was raised and trained as a show horse. He did eventing and dressage in his past, but we have only been working him on the flat as he as a slight club in his front right. At this time, however, he would NOT, however, be a good trail horse. We think he would be an exceptional fit for someone an experienced individual who wants to ride in the arena. 6. Quixote is really a fun, playful horse. He loves to play with his rope and jolly ball and whatever fun things he can find. He loves to snuggle and is truly a sweetheart, and he needs someone who wants to play with him and have fun with him. He DOES need someone who will give him firm boundaries, however, as he has a very strong personality and will try to intimidate people. If he is given those boundaries, however, he is really fun to ride and be around. He just needs that special someone who wants to both play and work. All of our horses have a $1,000 adoption fee. 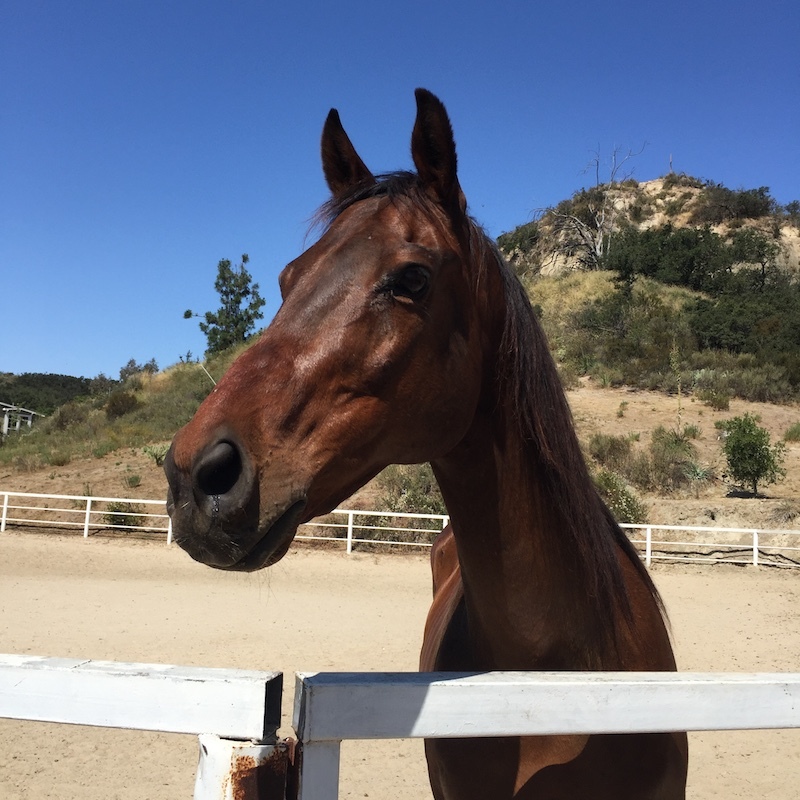 If you are interested in Quixote, please fill out our horse inquiry form. Click here to see a video of Quixote (this video was done in 2014).